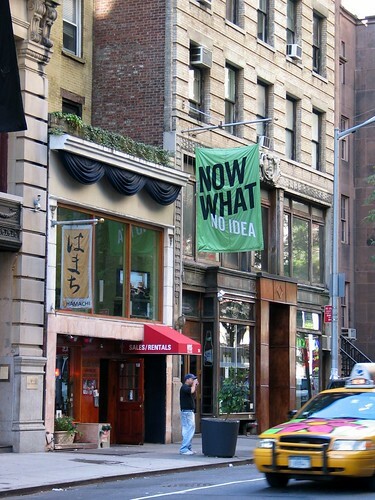 now what, originally uploaded by jahansell. Obviously not Sharon - I went to NYC on Friday. I didn't do a lot of shooting, but this sign struck me as pretty much summing up how i feel most of the time! (I wish I'd gotten a shot of another sign I walked by, for the Gotham Book Mart and its little sign that says "Wise Men Fish Here" - it was run for decades by Frances Stelloff, who was a friend of my grandmother and who I met when she was in her 90's (and still doing yoga headstands every day.) Frances is gone, my grandma is gone, and the Gotham Book Mart is closed, the building for sale. Nothing lasts forever, nor should it, as Hawthorne said in much more elegant words! And for those of you who have inquired - no, my camera did not turn up. I still have my very old Canon G3, which took this shot (and many of my best from the early days of this blog), and my newer Nikon D70 - but it was awfully nice having a pocket-sized one to carry around all the time!